Looking for a chic space to hold your next event or meeting? 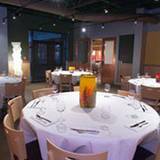 We cater to all kinds of private dining events, including Wedding Receptions & Rehearsal Dinners, Business Meetings, Birthday Parties, Reunions, Bar Mitzvahs, Holiday Parties - You name it! There are 3 completely private rooms & 3 semi private rooms available. We can accommodate up to 250 guests or as few as 10. Limited menus are offered for parties of more than 20. Private & group dining must be booked in advance by calling our Director of Sales & Private Dining. In addition to the rooms listed, we also offer a small semi-private room (The Maxwell) that seat up to 18 and a large semi-private room (The East Dining Room) that seat up to 90. Please fill in your information below and Heather Smith will contact you as soon as possible to book your event. If you’d prefer to talk now, please call us at (801) 944-8746 eext. t. 11.